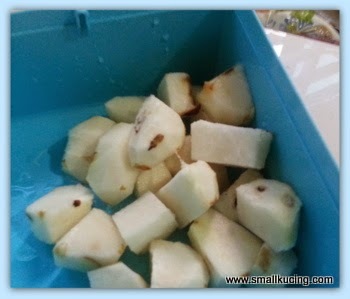 After Mamarazzi's experiment withe the Water chestnuts Thong Sui, she still have some left over. Bought RM2 watercress from the market. Darn it...the next day it became yellow liao. Old stock? Well, Mamarazzi still managed to salvage a handful to cook. Just wash. Did not soak it in the water for long coz she discovered that if soak in water long time, the watercress will become bitter. Maybe coz it "hidup balik"? 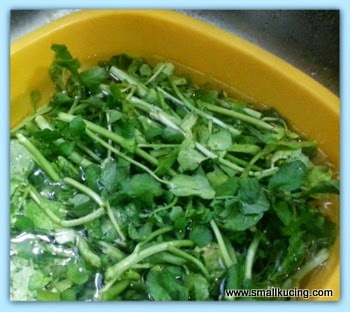 The soup taste much sweeter than the usual watercress soup. Mamarazzi loves the crunchiness of the water crestnut. Papa pulak in a frying mood . Bought a packet of the fish paste, taugeh, Daun Kuchai(Chives?) and carrot. Mix everything together and fry. This is the end result. Not bad leh. Got the crunchiness of the taugeh. You are so lucky that BOTH your parents are cooks! I love water chestnuts, too. I like what your papa cooked. Wah!!!! So pandai hor. I thought he pandai eat only. Hehehehehehe!!!! 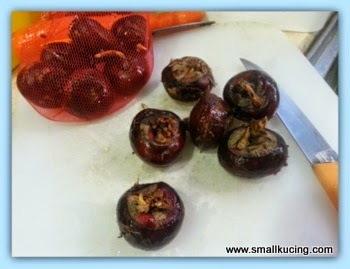 I like sai yeong choy tong too.. Yep, usually will boil with watercress, red dates and pork ribs.. Sedap to the max! During pregnancy they say cannot drink so much, coz the soup is "leong" one.. But now, weather so hot in the afternoon, nice to have a bowl of sai yeong choy soup too..
Yummzz, I love the fried fish cakes.. But my style very simple nia.. I mix pork, fish, one egg, spring onions (choong), corn starch, soya sauce and pepper.. I don't think I will open wok and fry too, coz I'm lazy ma, then need to deal with oil splatters and all.. I think I will roll into balls, then bake in oven, hehe, lazy style punyer version.. 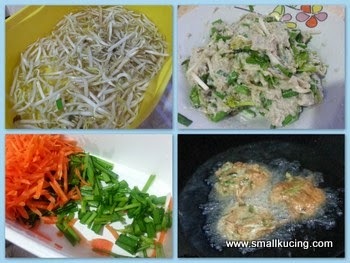 But of coz, frying version is more sedap.. I would like to have a pieces with cili+mayonnaise dip please! 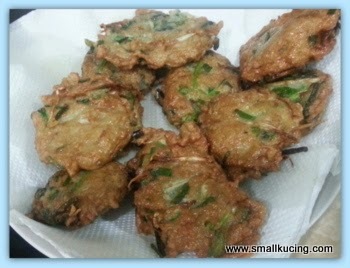 I don't really like to eat taugeh leh, like those serve as side dish of fried kue teow!!! But if cook like this I would eat la...don't know why!!!! O.o!!! We eat watercress, but not soup. Must try, thanks! I used to love watercress soup, but now, I prefer salted vegie soup. Ahh.....craving to drink some now ! Taugeh fritters? Sounds good. I like eating water chestnut just like that. hehe. What a lucky boy you are! It is so rare that I see both a mummy and a daddy cooking up a banquet in the kitchen. This is a good and happy family bonding that made your meals so delicious!!! This Fish Paste with Taugeh convinced me that it is a yummy food! This Kaldip's own patent recipe kah? I could only think of the nearest recipe is the Thai Fish Cakes minus taugeh. Yeah, watercress is a fast-perishable plant that's why I normally buy two bunches. I sometimes like to just fry it with garlic and mini-anchovies and a slice or two of ginger. I normally soak vegs with salt added in the water - to dislodge worms. Believe me, even such clean-looking cauliflower does have pretty light-blue worms. Okay, back to watercress, the trick to not having bitter watercress soup is to put in the watercress ONLY when the water is boiling. Try it the next time. yea wor...kinda hard to get sometimes. but when you dont need it , you will see it every where. Ini Mama Kucing always so creative one! That soup must be very cooling and yummy! 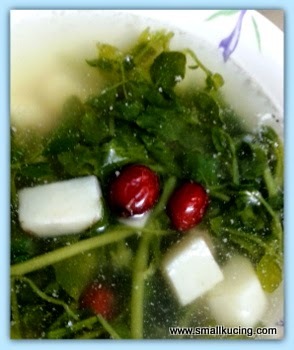 Good afternoon.... new way of cooking the watercress soup... looks delicious! Both parents are good cook - small kucing is so lucky!